Find out which of your favourite luxury hotels have done Malaysia proud with international and local recognition, from coveted winning titles in the World Luxury Awards to four-star ratings in the Forbes Travel Guide. 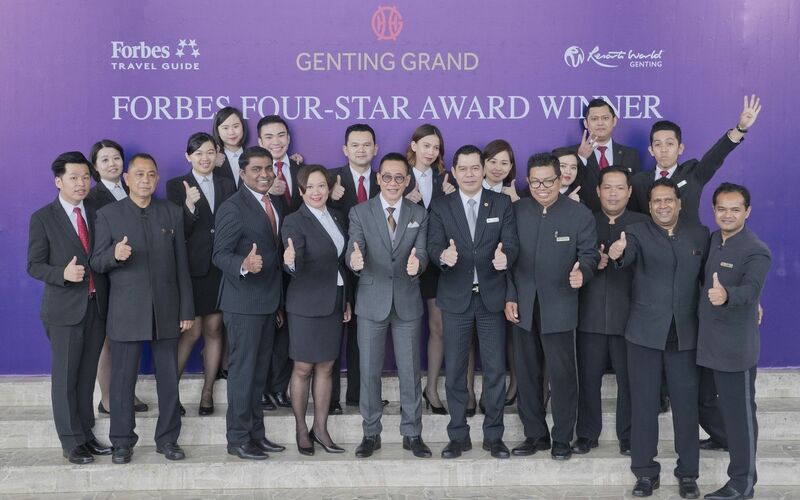 This year marks the first time that the Forbes Travel Guide Star Ratings survey has set its sights on Kuala Lumpur, bestowing a coveted 4-star rating on Resorts World Genting’s flagship Genting Grand Hotel and showering praise for its decadent rooms, luxurious restaurants and rejuvenating M Spa. Enough to tempt you for a mid-year holiday to Genting? Click here to find out more. Clinching the ‘Recommended’ citation from the Forbes Travel Guide Star Rating list is Maxims Hotel also at Resorts World Genting. Maxims dazzled the Forbes Travel Guide inspectors with its super exclusive VIP-only suites on the 15th and 17th floor as well as the 18th floor’s posh trio of apartments with its designer furniture, elaborate art pieces and gorgeous vertical gardens. Discover more over here. Tanjong Jara Resort's Spa Village was named Best Spa (hotel and resort category) in the 2018 Malaysia Tourism Awards. Expect pampering sessions here like the ‘Mandi Bunga’ pre-treatment floral bath ritual (dispelling negative energy and inviting blessings) as well as other treatments steeped in traditional healing practices like the Asam Roselle and the Syurga Tujuh (Seven Steps To Heaven). Find out more details here. The Hilton Kuala Lumpur earned some serious bragging rights when it won best Luxury Business Hotel and Luxury City Hotel at the prestigious World Luxury Hotel Awards in St Morits at the end of 2017. In case you missed it, Hilton KL’s massive Presidential Suite also earned the title of ‘Malaysia’s Leading Hotel Suite’ in the Haute Grandeur Global Hotel Awards in the same year. Click here to find out more. Given its innovative dining experiences and stylish ambiance, there’s always something to look forward to at Shangri-La Hotel Kuala Lumpur. The 5-star luxury hotel earned its third consecutive Platinum Award at the Kuala Lumpur Mayor’s Tourism Awards last year, just months after reopening a refurbished grand ballroom and other key areas. Click here to find out more. So far, 2018 has been good to The St Regis Kuala Lumpur. Having recently won the Best Hotel Services in the Malaysia Tourism Awards in February, it also emerged as TripAdvisor’s 2018 Traveller’s Choice Winner. To top it all off, The St Regis KL’s renowned Iridium Spa took home the Malaysia Luxury Wellness Spa and Malaysia Luxury Hotel Spa awards at the World Luxury Spa Awards 2018. More information is available here. Last year, the Mandarin Oriental KL won a 5-Star Hotel gold award at the Kuala Lumpur Mayor’s Tourism Awards. In the same year, it earned the title of Asia’s Leading Hotel Residences at the World Travel Awards. What’s next for this upscale luxury hotel in the heart of KL city? A weekend stay with your name on it, that’s what. Click here for more information. Digest Shellfish Lovers, Sink Your Claws Into Vasco’s Crab Chowdown Buffet!